Patrick Mahomes deserved a chance to answer New England’s game winning score. On Sunday night in the AFC Championship Game, the Kansas City Chiefs became the latest victim of the most inexplicable oversight in all of sports. Put simply, they lost their shot at a Super Bowl thanks to a coin toss. Yes, a coin toss. It went like this: the Chiefs and New England Patriots were tied at 31 after four quarters of play at Arrowhead Stadium in KC. Just like any other sport, a tie at the end of regulation means overtime. The first team to possess the ball in OT is determined by the aforementioned coin toss. The only problem is, if the team that wins the coin toss scores a touchdown on their ensuing drive, the game is over. This was the unfortunate fate for the Chiefs. Kansas City’s young star quarterback and MVP favorite, Patrick Mahomes, could only watch as his defense folded again and again on third down and Tom Brady and the Patriots slowly marched their way to the endzone and yet another Super Bowl trip. This ridiculously overpowered and unfair coin toss ruined what had been an unforgettably exciting game. 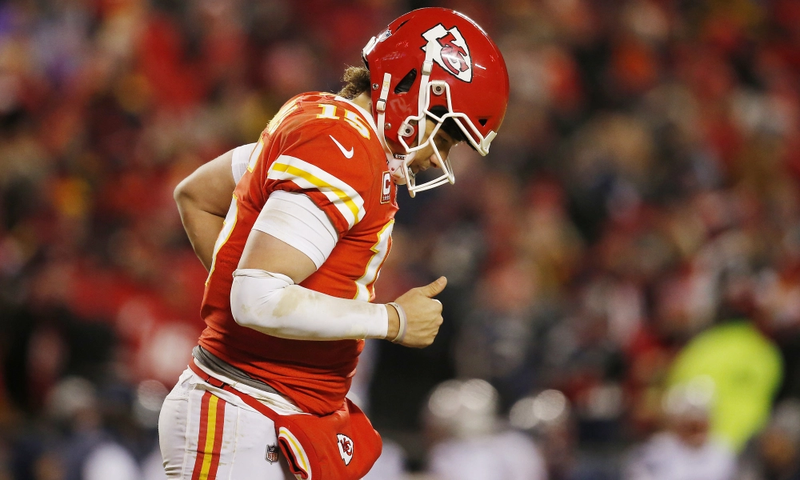 The Chiefs and Patriots had traded blows throughout an explosive fourth quarter, ultimately culminating in Mahomes leading his team to a game tying field goal despite beginning the drive with just 39 seconds left. The NFL rulebook robbed fans of what should have been an exciting overtime, as Mahomes never touched the ball again. It’s incredible that the NFL can’t see what most fans view as obvious: that both teams should get the ball in overtime. The winner of a game, especially one as big as the AFC Championship, should not come down to a coin toss. And make no mistake, the coin toss decided this game. The way both teams’ offenses were playing late in the game, there’s no doubt in my mind that if the coin had fluttered in the air one more time and landed on tails, that the Chiefs’ number one ranked offense would’ve reached the endzone just as New England did. Not to mention, even Brady himself mentioned the importance of the coin toss in his post-game interview on CBS, as he praised the team captain who had called heads. This instance is far from the first time that the infamous coin toss has spelled the end of a team’s season. There have even been multiple other instances of the coin toss deciding playoff games involving Brady and the Patriots. Way back in 2002, the Patriots won the coin toss in overtime against the Oakland Raiders in the divisional round and Adam Vinatieri kicked the game winning field goal a few minutes later. The NFL has changed the rule since then to not allow field goals to end the game on the first possession, but more still needs to be done. New England was again fortunate in Super Bowl LI two years ago, as Matt Ryan and the Falcons offense watched Brady and Co. ride their coin toss “skill” to a Lombardi Trophy. The fact that this unfair rule coming into play in a Super Bowl wasn’t enough to get the league to change their ways is very troubling. Lastly, one of the more memorable playoff coin toss-aided results was the 2016 divisional round win for the Arizona Cardinals over the Green Bay Packers. Packers quarterback Aaron Rodgers threw an unbelievable game-tying Hail Mary to get the game to overtime, only to see his team lose the coin toss and fail to hold the Cardinals out of the endzone. The answer to this problem is simple. The overtime rules, at least in the playoffs, need to change. Imagine if an NHL playoff game that was tied at the end of regulation was decided by a coin flip that decided which team would get to attempt a game-winning penalty shot. Or, if the MLB had a coin toss in extra innings that chose one team as the first one to bat, and if they scored a run the game was over. These ideas are clearly outlandish, and so is what the NFL currently has in place. As an alternative, they should take a page out of college football’s book, where both teams get to have a drive starting at the 30-yard line before one of the teams scores more points than the other. The 30-yard line is likely too close for the NFL, but how about giving each team the ball at midfield or at the opposite 25, like a touchback? It doesn’t matter how long it would take; NFL playoff games should decide a clear winner in an unquestionably fair manner, as there’s too much on the line for a silly game of heads or tails.